The Apple TV box can play content from your iTunes account, Netflix and YouTube in up to 1080p HD. The box is tied to your Apple account though so you cannot stream from your media folders or multi-format files. Apple TV is available for about $100 and provides a lot of support for many Internet video subscription services. Apple TV is neatly encased in a small black box. You will find all available inputs and outputs on the back including power, HDMI, micro-USB, audio, and Ethernet. Connecting to your Internet access is very simple. Just sign into your WiFi; this can be done with a remote control provided with Apple TV or with the remote apps included in other Apple mobile devices. The content available on Apple TV is impressive. There is also no rush to watch your video once it has been selected. Apple TV will give users 30 days to begin watching the video once they have chosen their program. Additionally, once they have begun watching the video they have a full 24 hours to complete it. All movies and television shows that have been aired in the past are available through iTunes via the cloud and users who subscribe to iTunes match can find their entire music collection available in the music tab. There are a number of popular internet video subscription services available with Apple TV other than iTunes. Apple TV has excellent support for Netflix. Apple TV will organize Netflix's entire catalog for users to view easily. it's possible to watch your Netflix subscription in 1080pHD with Digital Dolby. Additionally, users can even create a Netflix subscription from their Apple TV device. Furthermore, Apple TV users can enjoy Hulu Plus programming as well. Hulu Plus offers a large variety of television shows for most seasons from many popular networks television channels such as ABC, Fox, NBC, Comedy Central, MTV, The CW, and Univision. Users can also watch movie trailers and popular films with their Hulu Plus description. Just like Netflix, users can subscribe to Hulu Plus through Apple TV. Apple TV really excels in providing users ability to watch their own content on their television screen. it's possible to view pictures and home videos through this device. A user will only need to click computer on the Apple TV menu, locate the content, and begin viewing. Additionally, Apple TV will allow users to access their contents with iCloud. Choose your iCloud photo stream to access all of your available images. A user can even watch their favorite videos from YouTube and Vimeo on their Apple TV set up. In fact, Apple TV makes it very easy to watch many types of Internet media. This includes Flickr streams, MobileMe galleries, and most other media found on the Internet and you can even create slideshows to be used as screensavers. Apple TV will go one step further with image viewing and provide users with a large selection of high resolution images provided by National Geographic. Sporting fans will be particularly pleased with Apple TV. 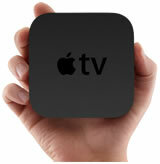 Apple TV makes it easy to access your favorite games and other sporting events on this device. Subscribers of MLB.TV can watch their favorite baseball teams. Even if you have no MLB.TV description, it's possible to get real-time scores, schedules, and stats. Of course it's also possible to subscribe to MLB.TV from your Apple TV. But baseball isn't the only sport users can enjoy. Apple TV also offers support for NBA.com to watch video highlights in sporting events from your favorite basketball teams. But sports fans can look forward to two other types of sports as well. NHL.com is also supported your Apple TV. You can subscribe to NHL game center on your device and watch hockey games in high definition. Finally, users can also enjoy breaking news from CNN and Wall Street Journal Live. If you are pressed for time, it's possible to watch summaries of the news stories available 24 hours a day. Apple TV provides much support for many other popular Internet video subscription services. If you are a huge iTunes user, Apple TV is the perfect complement that makes it possible to watch iTunes selections from your living room. At only $100, Apple TV is very affordable. It is also very easy to set up. In our book, these are big pluses.